This page collects together some of the videos and animations we have made. Some animations are available both as a video for you to play directly and as a Matlab .mat file that you can play using the function showmotion in Spatial v2, which will give you a much better viewing experience. To download the .mat file, click where you see the icon SV2. This video shows Tippy balancing while simultaneously following a command signal that specifies the motion of the crossbar. You can see the command signal in the left part of the video. The balance controller includes a balance offset observer that measures the difference between true and estimated balanced configurations so that the controller can improve its estimate. You can see this happening during the first few seconds, and again near the end of the video when the robot is being pushed. The command signal asks Tippy to make some very fast movements, and you can see that Tippy responds very quickly. You can also see it leaning in anticipation of the command signal. Finally, the video shows Tippy resisting and recovering from large external disturbances. For more details see publication 17. These animations show what bend-swivel balance control looks like. 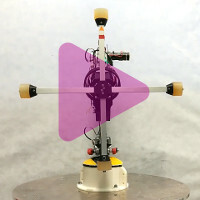 In this strategy, the bend angle is controlled by a 2D balance controller, and the task of the swivel controller is to keep the bend plane vertical and control the overall heading of the robot. The animation on the left shows Morteza's original implementation; and the one on the right is a more recent implementation by Roy on a Tippy-like robot. Both keep their balance very well, but neither tracks motion commands accurately while swivelling. The likely reason is gyroscopic forces. See publications 6 and 8. The one on the left was Roy's first demonstration of leaning in anticipation. It was presented at talk 1, and shows a simple bending and straightening movement performed twice without leaning in anticipation, and then twice more with leaning in anticipation. The graph of the response is here. The one on the right begins with a sequence of movements performed without leaning in anticipation, and continues with a similar sequence performed with leaning in anticipation and much higher feedback gains, resulting in much faster, sharper movements. Gains this high would be completely impractical without leaning in anticipation. See publication 14. This is the animation that Roy showed at Int. Symp. Robotics Research (see publication 10), and again in talk 1. 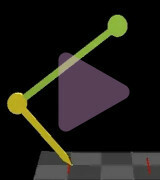 It is the only animation that shows the balance controller operating together with a motion controller. 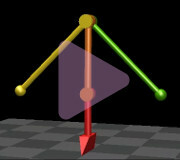 It is also the only animation to show a branched kinematic tree; and it is the last animation that Roy made before working out how to do leaning in anticipation. The animation begins with three bending and straightening motions. In the first, the balance controller operates the lower joint; in the second it operates the upper two joints; and in the third it operates all three. 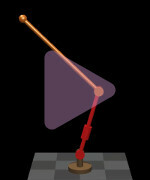 In the remainder of the animation, the balance controller operates only the lower joint. 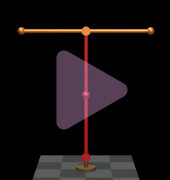 This animation shows Morteza's balance controller performing single hops beginning and ending in a balanced upright configuration. The robot is based on the Acrobot, as defined here. The sequence of actions is more complicated than it appears. First, the robot must maintain its balance in the initial position. Then it must crouch down and lean forward (deliberately losing its balance), and then push with the right speed and timing in order to reach the right lift-off momentum (linear and angular) as the foot leaves the ground. Then it has to control its foot trajectory during flight in order to land on the right spot. Finally, it has to recover its balance after landing, and return to an upright configuration. And all of this is done using just one actuator. See publications 4 and 6.